It's time again for another Food Fight and I'm so excited about this month's theme: ICE CREAM! The Food Fighters were not given any particular flavor...it just had to be ice cream. It could be an ice cream maker recipe or a no-churn. I love both and look forward to seeing what other recipes are shared today. Plus I'm really excited to see if there are any creative flavor combinations. I went through my recipe binder to see what I had in my dessert section for ice cream. I found a clipping from Food Network Magazine for Maple-Bacon Crunch Ice Cream. Personally, I'm not a big fan of maple syrup at all. But Nick (my husband) loves it and I am no stranger to making foods that someone else may like that I don't. Nick about died when he heard I was making a maple ice cream with bacon brittle in it. From an objective standpoint, the ice cream was very creamy - the perfect consistency. The crunch of the brittle was wonderful. It does taste like maple, but I will say that it wasn't an overwhelming maple taste and I think that is really appealing. The aftertaste almost reminded me of one of my favorite flavors of ice cream: butter pecan. Nick loved the ice cream and that's what I was going for, so it was definitely a winner. If you love maple and you love bacon, you will LOVE this ice cream. For the ice cream: Whisk egg yolks, sugar, and salt in a bowl until pale yellow. Pour into a saucepan and whisk in milk. Cook over medium heat and stir until it's almost simmer and thick enough to coat the back of a spoon. Transfer to a bowl and refrigerate about 30 minutes or until cold. Make brittle while egg yolk mixture is cooling. For the brittle: Prepare a cookie sheet with nonstick cooking spray or a silicone baking mat. In a heavy saucepan, add sugar, corn syrup, honey, salt, and water to a boil over medium heat. Stir until sugar is dissolved. Stir frequently until temperature reaches 300 degrees. Remove heat and immediately add butter and baking soda (it should start to foam and grow). Pour onto the cookie sheet and allow to settle on its own. Immediately sprinkle crumbled bacon over the top of the brittle. Let cool and harden. Once hardened, break into pieces. After the egg yolk mixture has cooled, stir the heavy cream into it. Then churn in an ice cream maker according to the manufacturer's directions. Break a third of the bacon brittle with a meat mallet. Then stir into the processed ice cream. Transfer to an airtight container and freeze for at least 2 hours until firm. I was happy to see a savory dish was the Peaches & Cream Food Fight winner. 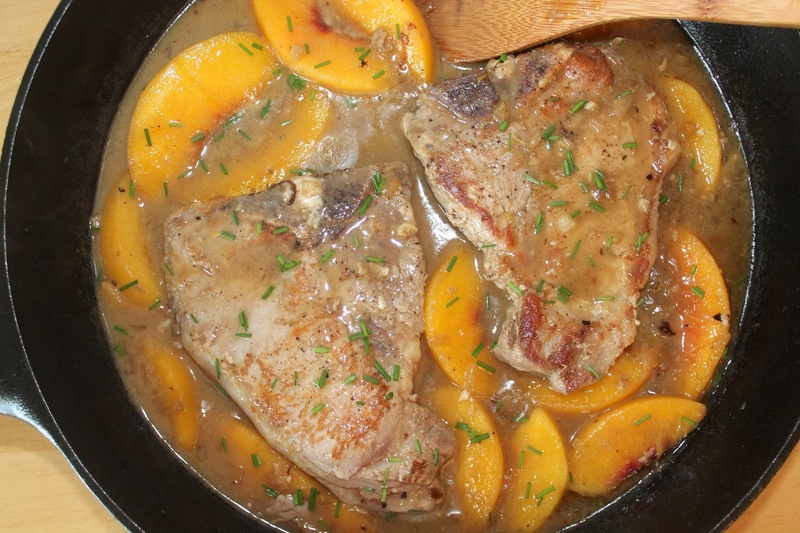 Congrats to Amy of Savory Moments for her Skillet Peaches and Cream Pork Chops being the most viewed recipe from last month!